One sign of possible nursing home abuse is the presence of bedsores on your loved one. Despite what facility administrators may tell you, they are not “normal” for nursing home patients. These progressive wounds indicate neglect and inadequate medical care. Bedsores are extremely painful and, in advanced stages, can lead to life-threatening infections. If your elderly family member has developed bedsores, the compassionate Los Angeles nursing home neglect lawyers at Taylor & Ring are ready and able to intervene. We help your loved one get proper medical treatment while holding the nursing home accountable for the neglect and injury that your loved one endured. Our law firm handles cases of nursing home neglect and abuse in the Los Angeles area and Southern California, and has successfully represented residents who have suffered bed sores as a result of neglect or abuse. 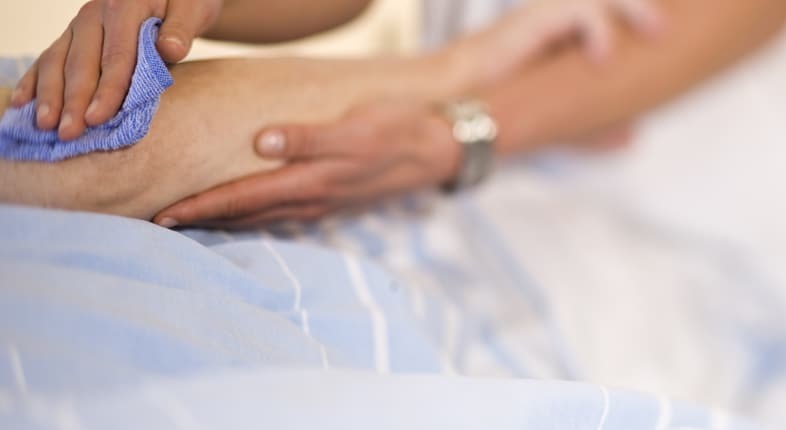 A bedsore, also known as a pressure ulcer, is a deterioration of the tissues around the bony points of the body. They most often develop on the elbows, hips, heels and tailbone. Lack of circulation causes redness and swelling, and then pain or numbness as the skin and surrounding tissues die. Eventually, they become excruciating, open sores that are difficult to heal. Bedsores are most common in bedridden patients who cannot move their bodies to relieve pressure and keep the blood flowing. Medical standards call for such patients to be turned or repositioned by staff every few hours to provide relief and prevent pressure ulcers. In reality, residents of short-staffed nursing homes are commonly left in one position all day long and their complaints are ignored until the bed sores reach advanced stages. Malnourishment and poor medical supervision also contribute to the development of bed sores, and nursing homes are often reluctant to transfer patients to a hospital. Wheelchair assistance. For patients who must use wheelchairs, adjustment is key to prevention. The individual’s weight should be shifted at least once per hour, if not more frequently. A specialty wheelchair can be used to assist with relieving bodily pressure because they tilt on their own. Well-positioned pillows can also assist with alleviating the stress that can lead to bedsores. A nursing home caregiver should understand the importance of shifting a wheelchair-bound patient and ensure that appropriate adjustments are made. Bed repositioning. Just as shifting is beneficial for patients in wheelchairs, it is also a useful tool for patients confined to a bed. These residents are often unable to reposition themselves, so it is the responsibility of staff members to do it for them. Shifting of the body should optimally occur every two hours. By using extra bed sheets, they can lift and move the patient with minimal friction and pain. Specialized mattresses also help to protect areas most vulnerable to bedsores. Well-placed pillows and cushions also help with necessary prevention. Proper skin care. When bed sores do develop, it is vitally important to treat them as quickly as possible. A patient’s skin should be inspected on a daily basis for signs of sores or irritation. The correct use of lotions and talcum powder is also important, in addition to changing the sheets and bedding on a regular basis. For patients with incontinence, it is extremely important for staff members to change diapers and keep areas as clean as possible. Nutritional tools. A healthy diet and adequate hydration helps prevent bedsores by improving the overall health of the skin. Nursing home staff members should ensure that patients are receiving well-balanced meals, along with a sufficient amount of hydration. Poor hydration can cause the skin to become dry and more vulnerable to injury. When these preventative measures are ignored and sores are allowed to develop, necessary treatment can range from pain medication and wound care to extensive surgeries. California has a strict elder care law designed to protect nursing home residents from the pains of abuse and neglect. Our experienced Los Angeles nursing home abuse attorneys invoke the full force of the law to force nursing homes, rehab centers and hospitals to compensate victims and to improve the level of care for all residents. We use our past successes to help our clients move forward into the future. If your elderly family member has developed wounds from negligent care, turn to Taylor & Ring. We hold the facility responsible for the costs of medical intervention and for your loved one’s needless suffering. Call us at 310-776-6390 or fill out our contact form to schedule a free consultation with our Los Angeles bedsore injury attorneys.